Ita-Nails refer to a form of nail art where you paint your favorite characters onto your nails. It's the perfect type of nail art for you to always be by the side of your favorite character! To solve this problem, we made our way to professional nail artist, Mr. Miyamoto, who offers Ita-Nail services! Moreover, we decided to record the entire process and bring you the finished movie. 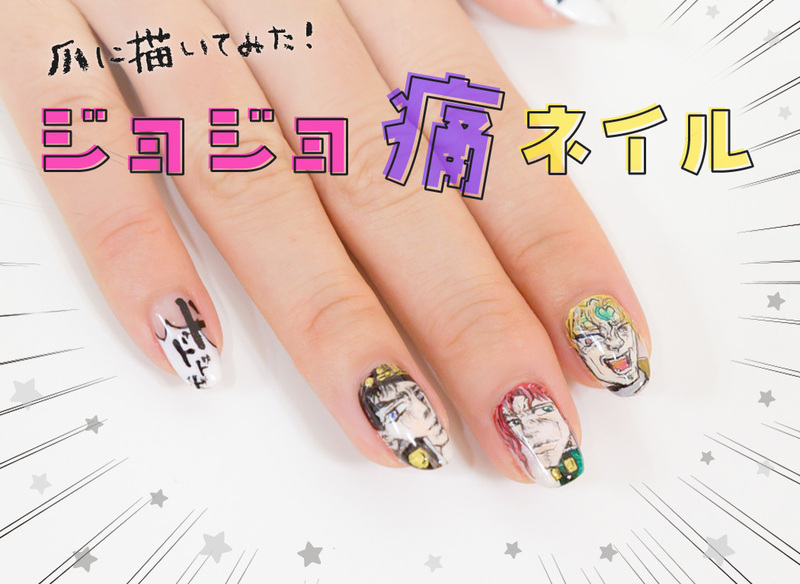 After the previous feature, which was all about Touken Ranbu-themed Ita-Nails, we tried our hand at 3 characters from the anime Jojo's Bizarre Adventure: Jotaro Kujo, Noriaki Kakyoin and DIO! How will the artist pull off such detailed drawings on some tiny human nails? Let's check! Dark and saturated colors are a distinctive feature of Jojo illustrations. Among all the characters, Jotaro is one of those with the most intense looking shadows marking his face. If we start out with an intense skin color, like we're going to do with the other two characters, this feature of him will end up not standing out so much. That's why I also used black acrylic paint to make the shadows stronger! Kakyoin has some sharp lines depicting shadows under his eyes and chin. In order to emphasize these shadows, I used black lines from the lineart phase. By overlaying a dark skin color, those black lines end up standing out even more. DIO is quite the western-like character compared to the other two. I want to express this feature of him in his skin color by adding a bit of a khaki paint into the mixture. I add some white too to recreate the typical Caucasian skin tone, with reduced yellowness. The 5 major steps, base coloring to lining, coloring, shadowing and the final touches have been packed into these compact 1 minute videos. Actually, it took the artist about 30 minutes for each character! Please stay tuned for the tomorrow's article, which will include more detailed explanations regarding the drawing process! If this video made you want to try out Ita-Nail art on your own, don't forget to check out our next article!